The Shield of Phi Kappa Psi is a quarterly publication. The Shield of Phi Kappa Psi is a quarterly publication that is mailed to alumni around the world. It is the single easiest way for our alumni to stay in touch with the Fraternity, keep up with the local chapters and associations, discover news about the Fraternity nationally and also the business of Phi Kappa Psi. Alumni are encouraged to submit ideas for articles or information that could be useful for publication. The winter and summer issues feature chapter newsletters, providing you with an update on what your chapter is currently doing. If you have a suggestion for an article, email us at Shield@phikappapsi.com. The Shield is available online. You can read the most current issue of the magazine (and search its contents). 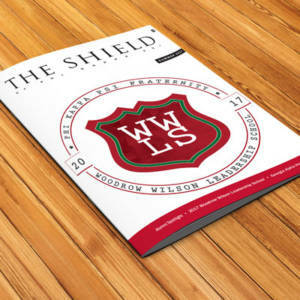 You can also read every issue of the magazine dating back to its creation in 1879 with our searchable Shield Archive. The Phi Kappa Psi Fraternity engages men of integrity, further develops their intellect and enhances community involvement. With a legacy built on acceptance and trust, each brother realizes his highest potential through a lifelong experience of service and excellence. © 2018 Phi Kappa Psi Fraternity. Website Design by Exceedion.com.